Dal from red lentils and a biryani spice blend over rice and delivered on some homemade naan. A side of Yogurt Raita composed of yogurt, freshly chopped mint leaves, cucumber and grated orange peel topped everything off. After having such a carnivorous meal the night before, I decided to go with the vegetarian option the next night (a true Omnivore at heart!). The Indian dish of Dal is a fantastic option, but by no means is it a “light” option. Before we get into the details, let me first address one point: I did not choose an Indian wine for this meal. The old adage of “What grows together, goes together.” does have some validity, but there is always one big assumption being made. That assumption is that wine is and has been part of the culinary culture of that region for quite some time. Regions tend to develop their wines over their history based on the foods that are being eaten. In fact, it’s one of the primary factors in developing a distinct list of characteristics of which a varietal should display. When you travel through wine country and eat and drink the local fare, you’re sampling the result of a very long-term trial and error process. It’s not that the wine and food pairings that you are experiencing are the only ways to pair the items or even the best, but they are a tried and true method of two co-developed components. At a minimum, it’s probably the least risky pairing you can find. On the flip side, let’s take a region that has only been producing wine and using it in their meals for a very short period of time; say, those in India. They have two major burdens to overcome. One is that the “standards” of what certain varietals should be like are developed by cultures with greatly different culinary tastes. For instance western cooking tends to pair ingredients with similar flavor compounds that amplify each other while eastern cooking tends to pair ingredients with differing flavor compounds. The second is that they haven’t spent as much time co-developing their wine and food (the long trial and error process) so they haven’t had time to work out the kinks yet. For Indian wine, my minimal exploration hasn’t led to anything of good quality or enjoyableness and I personally think this has a lot to do with their latitudinal position on earth (i.e. not between 30 and 50). However, I will continue to explore it much more thoroughly before I make any final judgements. But back to the wine and food experience! I originally wanted a dry Muscat with some display of orange peel on the nose and palate for this to play with the hints in the Raita, but sadly a dry Muscat proved difficult to find. Therefore, I opted for the Muscadet from the Server et Maine appellation in the Loire Valley, France. 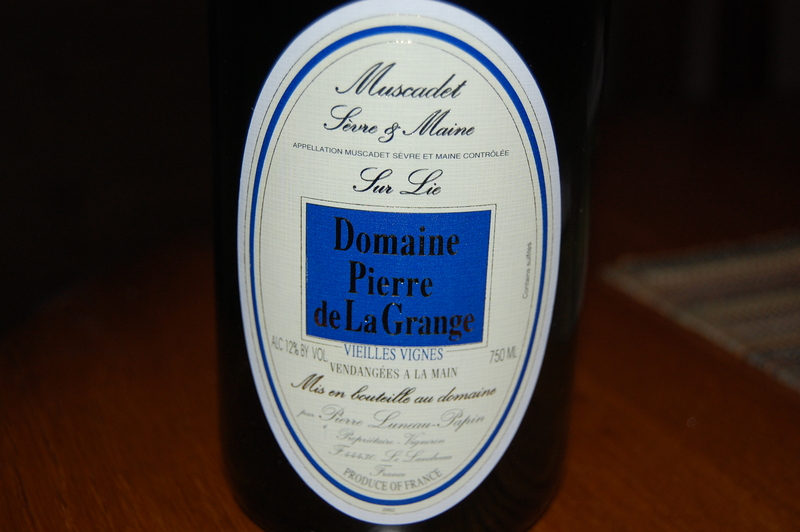 Muscadet, in general, isn’t terribly remarkable. In Server et Maine, they let the lees, the solid sediment created after fermentation sit on the wine for awhile to impart quite a bit more character into the wine. In addition to the salt-air-minerality and light citrus, the wine has a yeasty, almost creamy component to it as well. If you see “Sur Lie” on a French bottle, this is what they have done. And it did work with the dal. I could have used a bit more citrus, some sort of floral or blossom component to play with the orange peel and mint in the Raita and the body was enough to not get lost, but could have been a bit more substantive to be a perfect pairing. The mineral notes added an interesting queue to the biryani spices (cinnamon, clove, cumin, coriander, cardamom) which I rather enjoyed though. While the yeasty/creaminess amplified the rice and yogurt flavors, the minerality was what added a layer of curious depth. 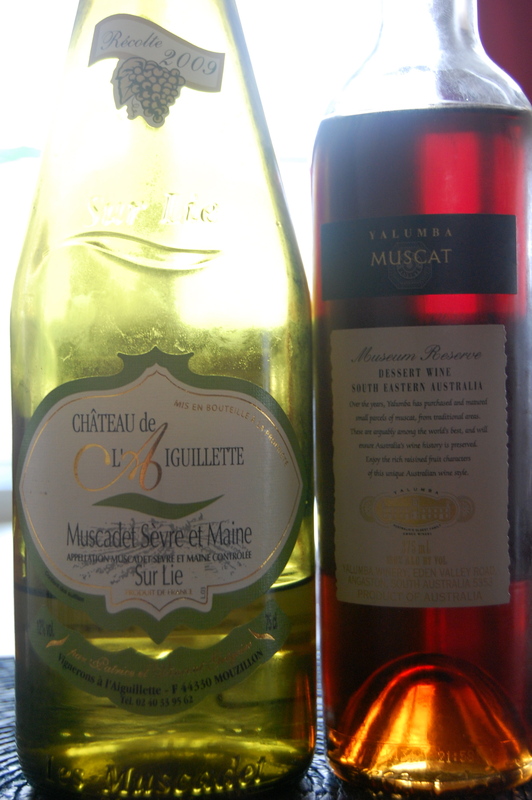 In a fit of determination and stubbornness, I had also picked up a bottle of Yalumba’s dessert wine Muscat. Orange peel, galore. This dessert Muscat from Barossa is fabulous as an aperitif or could go with a wide-number of light appetizer or dessert options. The sweetness was obviously way too much for this meal, but in teeny-tiny sips, alternated with the Muscadet, it was fun. For an analogy, I would compare my pairings in this meal to alternating something cold and something hot to get the perfect temperature (or switching between Papa Bear’s and Mama Bear’s porridge instead of stealing porridge from a Baby Bear). While I wouldn’t recommend doing a co-pairing at a meal for someone you are trying to impress since they’ll just assume you are trying to get them drunk, it is a fun experiment to attempt. Fantastic spring meal! To really top this off the Quinoa could have been cooked a little better (it was flash cooked due to a time crunch and therefore a bit too crunchy), the lemongrass that was bought at the Seward Co-op could have been added to my grocery bag and thus put into the steamed mussels and the Muscadet could have been aged another couple of years. The results of this would have been sublime.